In other words, the Bible is a complete guidebook for life. Like any guidebook or manual, the Bible only starts being useful when we start reading it (or listening to it). If you are involved with children either as a parent, friend or relative, you may wonder how to teach children to love the Word of God. The obvious first step is prayer. You can ask God not only to help you to teach your children (or grandchildren, nieces, nephews, young friends...) to love His word, but to help you to love it. After prayer, there are a number of ways to instil the love of God's Word in your children. Firstly, make God's Word familiar. The saying “familiarity breeds contempt” does not come from the Bible! In fact, God instructs His people to have His words in their hearts (Deuteronomy 6:6, Deuteronomy 11:18, Psalm 119:11, and Colossians 3:16 are just a few of many references). Especially for young children, making God's word familiar, comfortable and safe will help them to love it. You can do this by incorporating God's words of comfort into difficult, scary and stressful situations. An anxious child can be reassured by the story of how God revealed His heavenly protection to Elisha's servant (II Kings 6:8-23), or the account of the Hebrews God rescued from the fiery furnace (Daniel 3). When my daughters have been feeling discouraged or defeated, I've written down scriptures that they keep on or near their beds to remind them of God's faithfulness. One favourite in our family is: What then shall we say to these things? If God is for us, who can be against us? 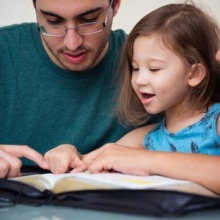 (Romans 8:31) If you're new to the Bible yourself, you may like to find a mentor who can help direct you to stories and scriptures in the Bible that apply to each situation you face with your children. You can also make the Bible familiar by putting scriptures and stories into song. You don't have to be musical – lots of scriptures can be sung to the tunes of simple songs such as Twinkle, twinkle little star! There are also many CDs available where the job has already been done for you. 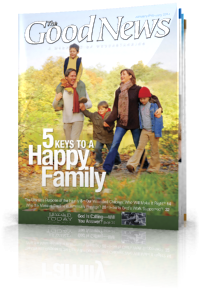 A second way to help your children love God's Word is to make it relevant. For example, if you decide to start at the beginning of the Bible with God's creation, you might say something like -- On the third day God created the beautiful green grass, and the fruit trees. Or on the 6th day God created all the animals that live on land including dogs like our Spot. You can talk to children about Joseph (Genesis chapters 37 to 46) and doing the right thing even when we are tempted to make bad choices. You can study Proverbs and Ecclesiastes with older children and get them to suggest why a good name is so valuable. How are the people they know with bad reputations treated by others? These examples just scratch the surface of a book full stories of people who struggled through life just like us. As you take the time to prayerfully read the Bible for yourself, you will soon find many, many stories of people who were challenged like you, suffered life you, and – through God's grace and mercy – triumphed over obstacles, just as you and your family can. On the flip side, you will find out what happened to people who didn't overcome the obstacles in their lives because they turned their backs on God. You will also discover God's great patience and mercy with people who didn't trust Him. 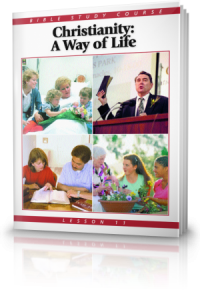 A third way you can inspire your children with a love of the Bible is by making it meaningful. The Gospels (Matthew, Mark, Luke and John) show the great love of God in sending Jesus Christ, His Son to die on our account. Above all the Bible is a story about God – who He is, what He cares about, and His plan for you and your family. Share that with your children! Let them see your enthusiasm for God's plan, and make sure they know that He wants them to be part of His family. Let them know that He wants everyone to be part of His family. None of these steps are a guarantee that your children will love God's Word – that's a choice they will have to make for themselves, but by introducing your children to the richness of the Bible, you are setting their feet on the right path.